Introducing: Karate Quips - unique and fun martial arts gifts for the black belt or beginner in Taekwondo, Tangsoodo, Karate and more. Designs available on shirts, hats, mugs and more. Choose a design for available products. Karate Quips signs, photo albums and more available at www.karatequips.com. Select a design to see it on Shirts, Hats, Coffee Cups and more! 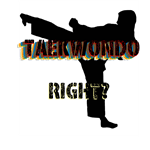 Let everyone know how Right TaeKwonDo really is! 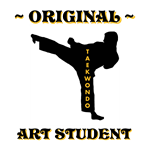 Martial Arts are the first arts - now you can show that you are an Original Art Student of Taekwondo. What's all the yelling about? Some get it, some don't - but the Yell is one of the most recognized aspect of many martial arts! Show your black belt spirit with the TaeKwonDo Black Belt Design on apparel, housewares, jewelry and more. Hinting of another galactic battle, these martial art sparring shadows enhance your Spar Wars warrior. The call of traditional TangSooDo! Martial art Power with Passion design for current and future black belts. 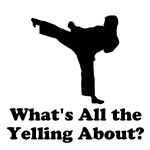 Powered By Taekwondo: Hat, Shirts, Mugs and more! Taekwondo Gifts: Powered By Taekwondo: Hat, Shirts, Mugs and more! Taekwondo: If you have to ask, you would not understand. TaeKwonDo Kicker with the classic KICK ME sign taped to the back! Travel the universe of your martial art and proudly display your commitment to your Trek! TKD Belt Colors: Discipline in Action. TKD Belt Colors: honoring the Traditional Values. Take your passion on the road with you, with a selection of travel mugs and water bottles! Judge Me By My Sais? With a nod to the great intergalactic master, this unique design is sure to please. Taekwondo Martial Artists and those with another favorite 'saga' will enjoy this unique and powerful design. Not for your average honor student, but for the above average martial art Student of Honor. Couple President Roosevelt with your favorite long staff and you have a unique, yet classic karate quip! High section round kick - why High Five with your hands? Show your hockey passion with the red Slap Happy design. Unique Karate Quips on clocks, keepsake boxes, pillows and more make for excellent gifts. Your favorite Karate Quips on coffee cups, mugs and steins.